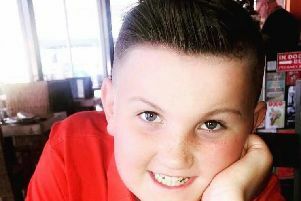 Friends and supporters of a charity set up in honour of brave Bradley Lowery have praised plans to create a holiday home for sick children and their families. The Bradley Lowery Foundation, launched in the wake of the six-year-old's death in 2017, could be set to receive a parcel of land in Scarborough to allow the home to be built. Bradley lost his fight to neuroblastoma cancer in July last year. His bravery and determination inspired thousands across the world. One of the last holidays the Lowery family had together was in Scarborough - and the Foundation hopes to create somewhere that families facing similar challenges to their own can make special memories. Scarborough Council's Cabinet is set to meet next week to discuss granting the long lease of land, which is to the south of Scalby Manor, to the Foundation at "nil value". Bradley Lowery lost his fight with neuroblastoma in July 2017. Picture: Bradley Lowery Foundation. A report, which will go before councillors next week, said: "The Foundation contacted the council to locate an area of land that could be leased to build a state of the art holiday home for children with life-threatening illnesses and their families." Dozens of people have now offered their support to the plans - and also to the Lowery family for keeping other people at the heart of their work, despite the tragedy of losing Bradley so young. Evelyn Hudson: "This is awesome well done. I hope the family are all keeping well, love to you all." Bradley enjoying his birthday party when he was six. Dallas McDade: "Fabulous news, what a wonderful family doing so much for others throughout all their own pain!" Donna Cleary: "Great idea. Scarborough is my spiritual home and would be an amazing place for kids to go for respite especially that location facing on the sea and peaceful." Rebecca Ross: "Fantastic news! some lovely memories for families to make in Bradley’s name." Bradley was an inspiration to people across the world. Picture: Bradley Lowery Foundation. Sylvia Weetman: "Well done Gemma that's great news Bradley's legacy will live on through helping others." Joanne Potts: "What a lovely thing to do and in a fab place too. All in memory of this brave little boy." Carol Gash: "This is awesome. Thoughts are with Bradley's family stay strong. Bradley will be the brightest star in the sky. God bless Bradley." Kay Armstrong: "Fantastic what a lovely thing for them to do and fantastic to you doing it. Wow." Julie Beck: "Amazing news I hope the family are all keeping well love to you all." Katharine Anne Craggs: "Love this news." Lesley Ann F: "Well done to all involved in making this happen." Sandra Rowe: "Well done Bradley always in our hearts."